One of the joys of being an entrepreneur is learning from the successes and failures of other entrepreneurs. Smart Hustle Magazine proudly shares those moments. Along with learning opportunities, Smart Hustle Magazine also celebrates the entrepreneurs who dedicate time and energy to building businesses that showcase and forward the values of the small business community. This is why Smart Hustle Magazine announces its very own Entrepreneur of the Year Awards for 2018. The awards program is designed to honor business owners, entrepreneurs, and champions of small businesses who exemplify the hustle, especially the Smart Hustle. The awards will feature professionals who are the leaders among entrepreneurs in the business community as they regularly demonstrate success while sharing with their peers. Each nominee must be a full-time owner of a business. Nominees must not be in the business on a part-time basis while working a day job elsewhere. Nominees can also be leaders of an active business association or community, or an active participant in an association or community. Businesses must earn at least $150,000 in revenue, but over $5 million. Nominees can also be a champion of small-business success, without currently owning a small business. There is no fee to nominate an entrepreneur, leader or champion of small businesses for the Smart Hustle Awards. Nominees will be asked to complete an intake form and they will be instructed where to show up for the awards program. Ramon Ray will be announcing the winners on stage and will present the winners with a prestigious glass award to symbolize their success and recognition. 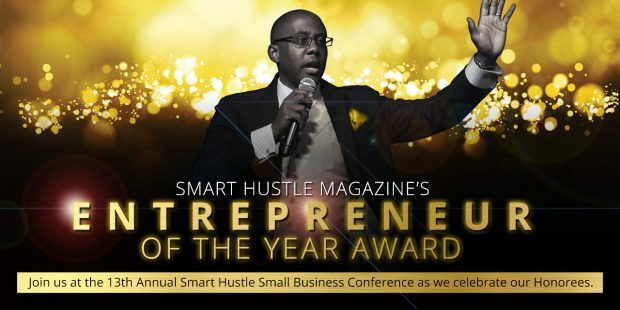 The Smart Hustle Magazine Entrepreneur of Year Awards 2018 will be celebrated on November 8 at the Smart Hustle Business Conference which takes place at the NYIT Auditorium on Broadway at 1871 Broadway near 61st Street. The conference is hosted by best-selling author, entrepreneur, and global speaker Ramon Ray. Other entrepreneurs like Mr. Cory of Mr. Cory Cookies; Laura Allen - The Perfect Pitch Girl; and Seth Godin, best-selling author of 18 books on entrepreneurship and business marketing successes. Register for the conference here. Early Bird Registrations end on September 30. VIP tickets are available. Smart Hustle Magazine would like to recognize the sponsors for the 13th annual event: Dell, LivePlan, ZOHO, The Mogul Mom, and Adrian Miller Sales Training.